Three young fans intently watching the action on the field. Unfortunately the home town team fell to the visiting Rochester Red Wings 5-3; but it was a great game. And this is a great shot. The attitudes are so well caught, I can imagine them biting their nails! The viewpoint and the monochrome finish give it a great 1950s ambience. Very nice! They certainly are engrossed in the game. My husband would be so envious! It looks a great game! The picture shows well how they follow the game with great attention! 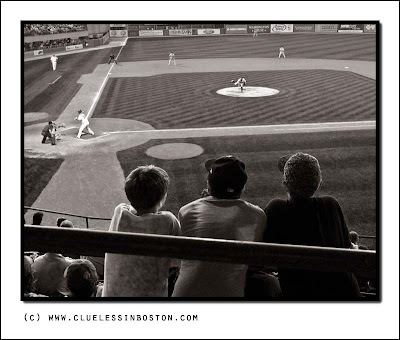 The US National sport shot in timeless b&w. This picture could have been taken any tine over the last 20 or so years. As always a great pleasure to visit your blog! I get to a ball game so rarely, but I've always had a blast when I went. Love the shot! Looks like a great spot to watch the game from and I really liked the warm evenings while there. This summer must of been the coldest in a long time here - the fog is rolling in as I type this. RE - Aunt Jemima syrup - the cafe was cheap, so I guess they had cheap stuff. I hate to admit this but we use Aunt Jem lite. I do like real maple syrup too. Excellent photo - it has a nostalgic feel to it because of the B & W. Perfect choice. Even if I am not that much into sports photography and especially photos of huuuuge stadiums ;-) I like this one very much. The three boys in the foreground and your use of them to give the whole pic a viewpoint is great.